Ensuring that your vendors are meeting their regulatory exam expectations must be a part of the scope of your vendor risk management program. Vendors that fail to meet the operational and regulatory compliance requirements from their regulatory agencies increase risk to your organization. 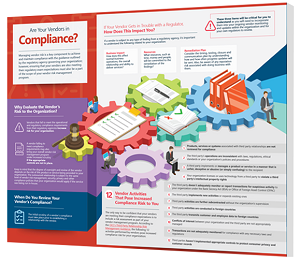 Download Venminder's latest infographic to learn about maintaining the appropriate level of oversight to manage and mitigate vendor compliance risk.